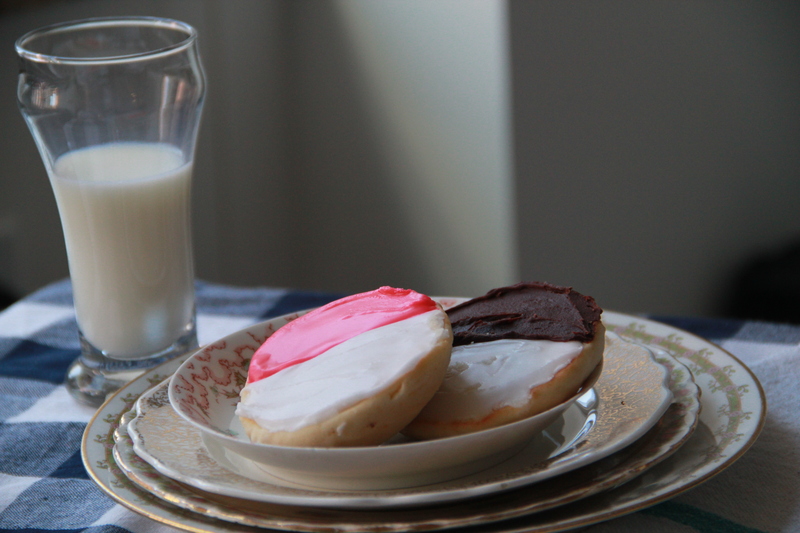 The black and white cookie. The official unofficial cookie of New York City. Or is it the unofficial official cookie? Hm. I made mine black and white and pink, for Valentine’s Day. Would Jerry Seinfeld approve? Probably not. But if you look to the cookie, you will see that these are really kind of perfect — they are a sweet sort of tribute, my personal homage to this city so nice, they named it twice; they are my little love letter to New York City, a city I’ve called home for three years, but which, quite soon, I will leave behind. For now. In just a few weeks, I’ll have a new coast and a new city to explore. San Francisco. San Francisco! California! Home of Alice Waters and Tartine bakery, of giant hills and the baseball Giants. And now, me! San Francisco! I couldn’t be more excited. Still, New York. I’ve done so much here. Met so many wonderful people. Walked so many beautiful, bustling walks. Eaten so many brilliant meals. This city has both exasperated and thrilled me for three very fantastic years, and I’m sad to leave. So these cookies, here? They’re coming with me. Look out, San Francisco. Here we come. Preheat oven to 375 degrees F. Lay parchment paper atop two cookie sheets. In a medium bowl, whisk together the all purpose flour, cake flour, salt and baking powder. Set aside. In a large bowl, cream together the butter and sugar until light and fluffy. Add the eggs, one at a time, mixing well to incorporate between each addition. Add 1 teaspoon vanilla and lemon zest, and beat to combine. Gradually add the flour mixture and the milk, alternating between each and mixing gently until batter becomes smooth and incorporated. Do not over mix. Use a 2-inch diameter ice cream scoop or large spoon to scoop cookies onto prepared baking sheets, leaving about 2 inches between each scoop. Bake cookies about 15 minutes, until puffed and golden at the edges. Allow to cool on a wire rack before icing. While the cookies are cooling, set a pot of water to boil on the stove. Add about 1/2 cup of boiling water to the 4 cups of confectioner’s sugar in a large, heatproof bowl, and mix vigorously to combine and smooth out lumps. Add 1 teaspoon vanilla extract, the lemon juice and corn syrup, and whisk to combine. The icing should be thick but easily spreadable — if it’s drying out quickly or looking too thick, just add more warm water by the teaspoon until you reach a workable consistency. Scoop just over half of the icing into a separate bowl, and set aside. Add the chopped, bittersweet chocolate to the icing left in the original bowl, and set the bowl over the pot of boiling water on the stove, to create a double boiler. Warm the icing and stir until all of the chocolate has melted. Add some more water to thin out the chocolate icing, if necessary. 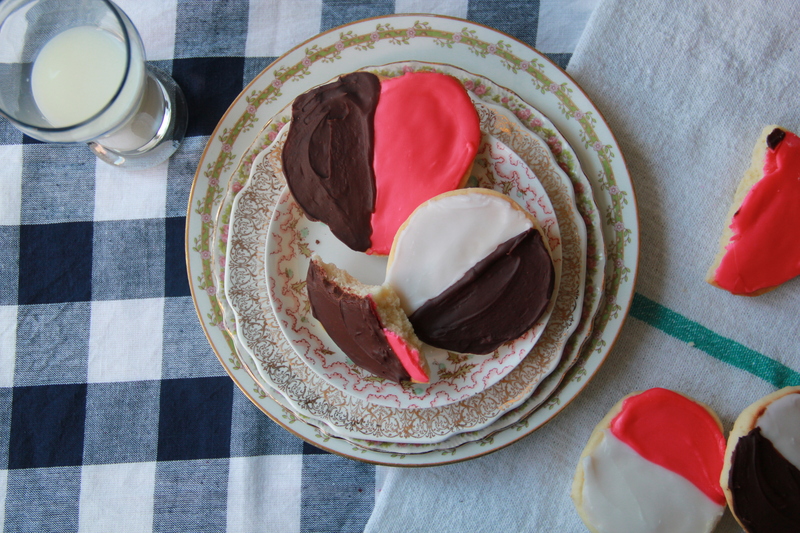 Turn the cooled cookies upside down, and begin to ice them with a small knife or offset spatula — be sure to frost the flat side of each cookie, and leave room for both the black and the white frosting. 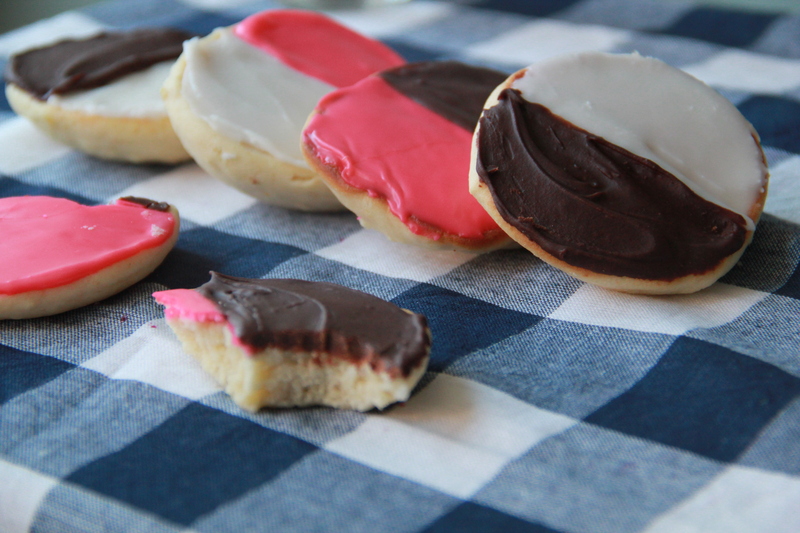 Once you’ve used enough white vanilla for your liking, add some red or pink food coloring to the remaining white icing, and stir to get the perfect shade for your Valentine. Continue frosting. If the icing becomes too thick or stiff while you work, don’t be shy about whisking in a few more tablespoons of warm water to loosen it up. Allow frosting to harden before serving with cold milk. Cookies are their absolute best on the day they are made and frosted, but will last for 3-4 days, tightly wrapped at room temperature. Makes about 30 large cookies. 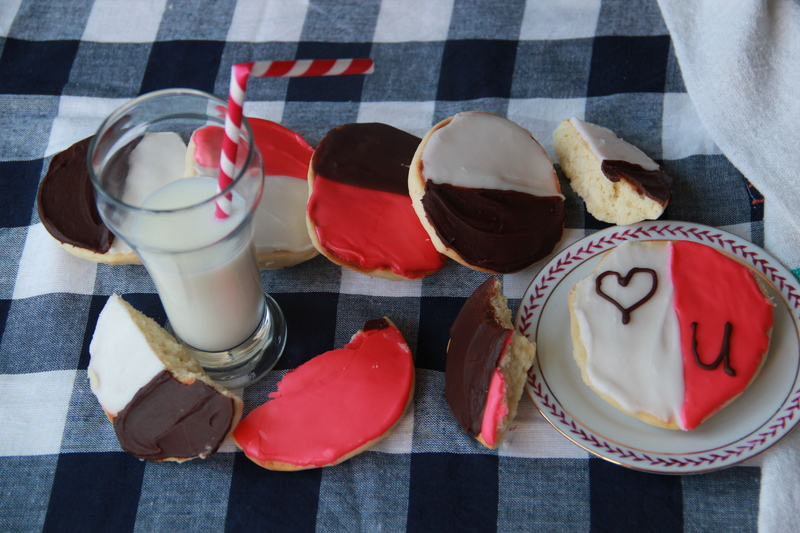 loooove black & white cookies! and the pink makes them just that much better! Best of luck with your move!! Ironically, now that you’re moving thousands of miles further than Boston, there is a better chance that I’ll be able to hang out with you. I’m going to be in SF the first weekend in April. Let’s get together! I especially want to introduce you to my SF peeps, including my other guest chef, Cara. Sounds great, Liz! Can’t wait!